L. Cydonia vulgaris, Ar. safarjel Fr. coing, MEng coines, coynes, connes, quyncis, quyncys, quyneys, quynade, Eng. quince. There are two varieties the common and the thick or Portuguese (gamboa, azamboa), see gamboa. The small quince tree is a native of northern Persia, between Armenia to southern Caucasus and Asia Minor. The Arabs brought it to Iberia. It blooms in Andalusia during March, while buds to not appear in northern regions of Spain until April. After September 11, St. Michel’s Day, the fruit appears shaped like a pear but if eaten raw, it is sour and bitter tasting unless left on the tree to fully ripen. Then it acquires sweetness. Unripe quince is placed in wardrobes for its aroma to make clothing smell good. As quince is bitter, it is baked with sugar to preserve it. Traditionally, it is preserved as jelly. The ME connate, conaunce, consisted of “quinces stewed in grease with honey, egg yolks, and almond milk. It was served sliced presumably cold.” Quince sauce traditionally accompanied roast partridge on English dinner tables. They used it in numerous tarts and frequently added it to apple pie to give it a special flavor. It is thought to be referred to in the Song of Solomon as an apple. Over the centuries there has been confusion between the apple and quince as it has been called the “golden apple.” Although it can be found still growing wild, during the Middle Ages, Greeks and Italians cultivated it and it spread throughout the Mediterranean and Europe. Perhaps Paris gave Aphrodite quince and not an apple. What about Eve? Was there a quince tree in the Garden of Eden? Ancient Greeks dedicated quinces to the goddess of love and thought them to be the symbol of fertility. A wives tale is that pregnant women who ate plenty of quinces produced very intelligent children. Among other remedies Hippocrates recommended them as an anti-diuretic and astringent in the form of a mucilage or jelly. During the Middle Ages, it was a common belief that quinces helped digestion, especially when served with meat. The Anon Al-Andalus calls for quince in numerous recipes. Served with lamb or veal it was thought good for those suffering from fever, increasing the appetite, protecting the stomach and preventing stomach vapors from rising to the head. 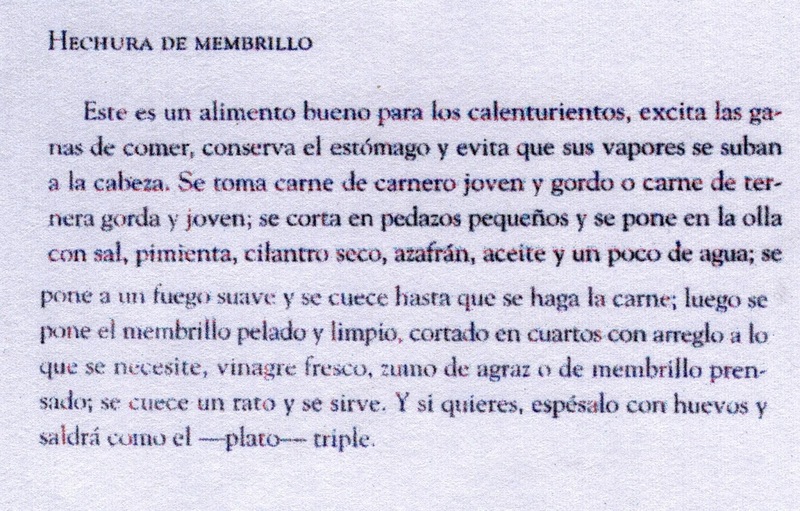 There is a recipe for sweetened quince taken in place of medicine to abate fever. Another recipe is to prepare a quince paste or jelly to relieve the stomach of one suffering from bile excretions, to improve bad breath, to increase the appetite and to prevent bad vapors from rising from the stomach to the brain. 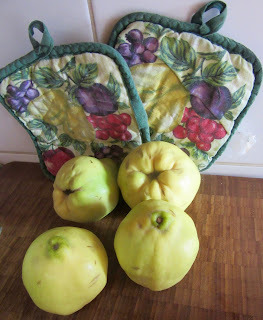 Still another is to made quince syrup to help digestion, quench the thirst and stop vomiting caused by bile excretions. 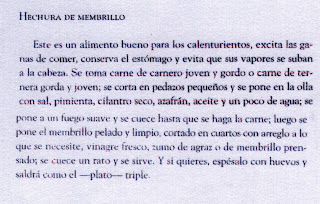 Nola does call for quince in various recipes and provides a recipe for a mutton pottage similar to an Anon Al-Andalus recipe but his collection is not peppered with medical explanations. [Anon/Anderson. 1962:46:52; Anón/Huici. 1966:180:322:284:522:293:541 etc; Curye. 1985:180; ES: Burkholder. Jan 9, 04; ES: “Don’t.” May 17, 04; Hartley. 2003:226; Hieatt. This is a good food for those suffering from fever. It increases the appetite, strengthens the stomach and prevents stomach vapors from rising to the head. Cut the meat into small pieces. Put it in a pot with the remaining ingredients, except the vinegar and eggs, and a little water. Cook over low heat until the meat is done. Wash and peel and core 2 quinces. Boil in water. When soft put all in a food processor and grind until a smooth sauce results. Set aside. Wash and peel and core the remaining quince and cut into fourths. 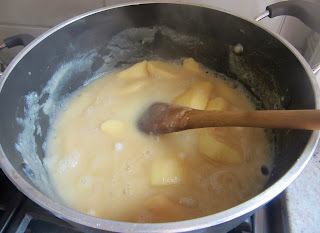 Put it in a pot with the sauce from the first two quinces or instead use vinegar or verjuice and boil until soft. Remove from hit immediately. Use it to garnish the meat. If desired cover the meat with eggs and the result will be a three in one dish.